Borderline case, part 2. Acer has combined an 11.6-inch Windows tablet with a keyboard dock, trying to win over buyers who do not want to decide between a tablet or a notebook. A passively cooled Core i3 processor provides the necessary computing power. Having tested the 900 Euros (~$1030) variant of the Switch 11 - the Switch 11 Pro - a few weeks ago, we now have the 600 Euros (~$690) variant before us. Immediately, the lower price indicates that there are reductions in terms of hardware. Instead of a Core i5 processor, the $690 model uses a Core i3. It is also equipped with a smaller capacity SSD (60 GB vs. 120 GB). In addition, the traditional hard disk built into the keyboard dock of the Core i5 model is missing. Our review reveals whether the Core i3 model can compete. Competitors of the Switch 11 include, for example, the Microsoft Surface Pro 3, the Lenovo IdeaPad Yoga 11S and the Asus Transformer Book Trio TX201LA. Since both Switch 11 models are identical in construction, we will not go any further into details of the case, equipment, input devices, or speakers. 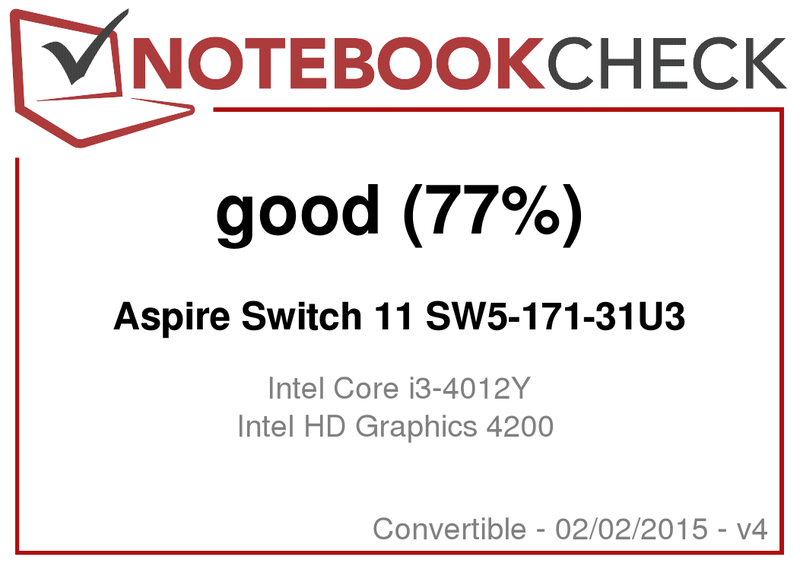 This information can be found in our test report on the Aspire Switch 11 Pro. The keyboard dock of the Switch 11 Pro includes the usual 2.5-inch hard disk. 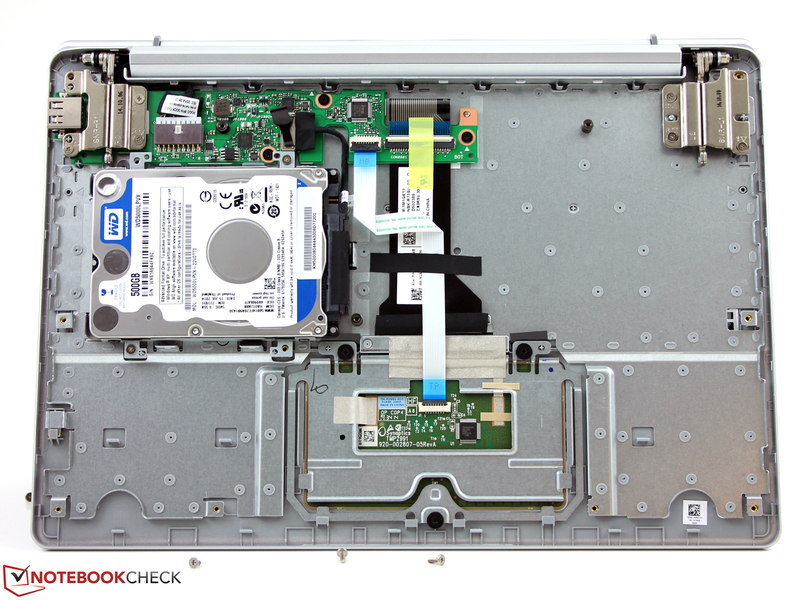 In principle, a hard disk could be incorporated into the Switch 11's dock as well, but this machine contains neither the corresponding connection cable nor the hard disk frame. The Switch 11 is equipped with a glossy 11.5-inch display that has a native resolution of 1920x1080 pixels. It offers a brightness of 279.3 cd/m². These are good values in principle, but the brightness of a tablet should be over 300 cd/m². Contrast (394:1) and black value (0.8 cd/m²) are still acceptable. Nonetheless: a $690 machine must offer more. In terms of color reproduction, the display gives no cause for criticism. The average DeltaE-2000 deviation sits at 3.39 in delivery condition, thereby just barely missing the target range (DeltaE below 3). The monitor shows no blue tint. Acer has equipped the Switch 11 with an IPS panel. The monitor can be read from any position. The machine can definitely be used outside. Still, use should be restricted to shady areas. Usage in bright sunshine becomes difficult to impossible because of the glossy surface. Acer's 11.6-inch convertible is aimed at potential buyers who are hesitating between a tablet and a netbook/subnotebook. The computer offers enough processing power for office and Internet use. 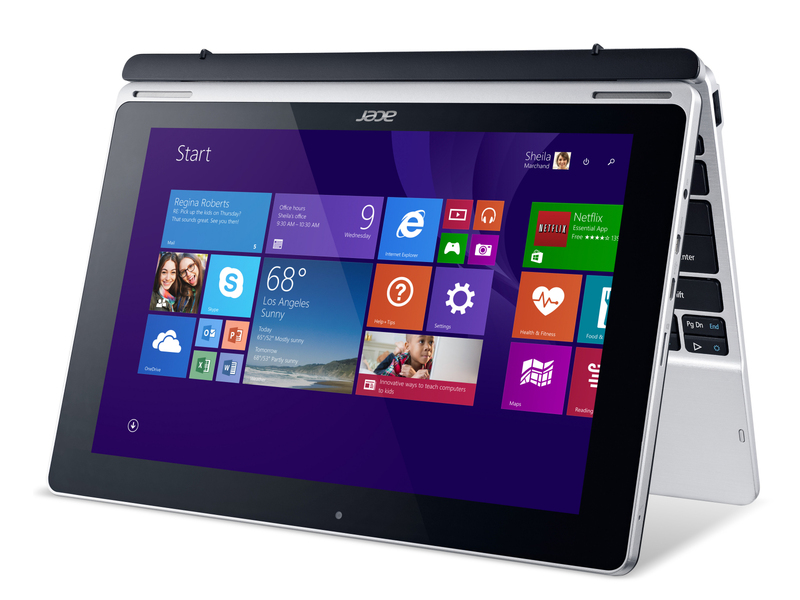 Our test machine is available for about $690; Acer also offers alternatively equipped variants. The Switch 11 is equipped with an Intel Core i3-4012Y (Haswell) dual-core processor. The CPU runs at a speed of 1.5 GHz; there is no turbo. The processor supports Hyperthreading (two threads per core can be used). Intel measures the TDP at 11.5 Watts. The full processing speed of the CPU is available even on battery power. 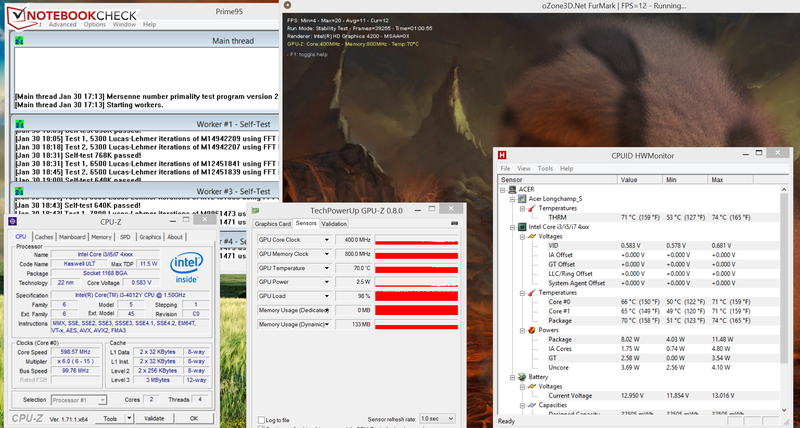 The CPU tests of the Cinebench Benchmarks are consistently processed at 1.5 GHz. The Core i3 processor and the speedy Solid State Disk offer a fast, well-rounded system. The results in the PCMark Benchmarks demonstrate the hardware's system performance. The Switch 11 Pro, equipped with a stronger processor, had somewhat poorer results than the model now before us. The reason: the Switch 11 Pro has a traditional hard disk as well as an SSD. Since traditional hard drives are noticeably slower than SSDs, the Switch 11 Pro cannot break away here. The Switch includes a solid-state disk from Lite On. This offers a capacity of 60 GB, of which 40 GB is available for use. Read rates do rather well in general. Write rates lie well below today's possibilities. There are many SSDs available that have higher write rates. Intel's HD Graphics 4200 graphics core is responsible for graphics performance. The GPU supports DirectX 11 and runs at speeds between 200 and 850 MHz. Thanks to the RAM working in dual-channel mode, the GPU averages a somewhat better performance in 3D Mark benchmarks than other computers that boast an HD Graphics 4200 core. The CPU and GPU of the Switch 11 are not meant for 3D games à la “Far Cry 4” or “Assassin's Creed: Unity”. Only a few games achieve playable frame rates at all - at minimal resolution and low quality settings. This is different with games available from the Windows Store. As a rule, these games present no problems. The Switch 11's processor is passively cooled, and there is an SSD for data storage. Thus equipped, the computer emits no noise. The Switch 11 during stress test. The Switch 11 runs the stress test (Prime95 and FurMark run for at least an hour) both on and off battery power. The CPU and GPU work at their full speed before being throttled back. The processor runs at 600 to 900 MHz. In the course of the test, the speed evens out at around 600 MHz. The graphics core runs at 500 to 550 MHz. Its working speed also drops with increased time and evens out at about 400 MHz. However, the reduction in speed does not prevent the Switch 11 from exceeding the 40 degrees Celsius (~104 °F) threshold in certain places. (±) The average temperature for the upper side under maximal load is 37.1 °C / 99 F, compared to the average of 30.3 °C / 87 F for the devices in the class Convertible. (+) In idle usage, the average temperature for the upper side is 27.7 °C / 82 F, compared to the device average of 30.3 °C / 87 F.
(-) The palmrests and touchpad can get very hot to the touch with a maximum of 43.5 °C / 110.3 F.
(-) The average temperature of the palmrest area of similar devices was 29 °C / 84.2 F (-14.5 °C / -26.1 F). While idling, the Switch 11's energy usage remains well below 10 Watts - we are used to this from computers with Haswell processors. We measured the highest power consumption (22.6 Watts) in the first few seconds of the stress test. Afterwards, CPU and GPU were throttled back, which led to lower power consumption. Overall, the power consumption is at a normal level for the built-in hardware platform. In the practical WLAN test, websites were loaded automatically at 40-second intervals. The energy save profile is active and display brightness is set at about 150 cd/m². The Switch reaches a run time of 5:31 h., holding out longer than the Core i5 sister model. This is not surprising, since that model is equipped with a more powerful processor and a traditional hard drive. With a price of just about 600 Euros (~$690), the Aspire Switch 11 SW5-171-31U3 is about 300 Euros (~$350) cheaper than the Core i5 sister model, which we have also recently tested. The Core i3 processor offers more than enough performance for everyday use. The computer runs completely silently and thanks to the built-in Solid State Disk is very fast. The Core i3 model before us is also equipped with an IPS Full HD monitor. It offers better brightness than the panel built into the Core i5 model, although it also offers less contrast. One positive aspect: the Switch 11's Core i3 model offers better battery life. The warranty of only 12 months, presents one clear drawback. With a $690 machine, we would like to see a two-year manufacturer's guarantee as standard. 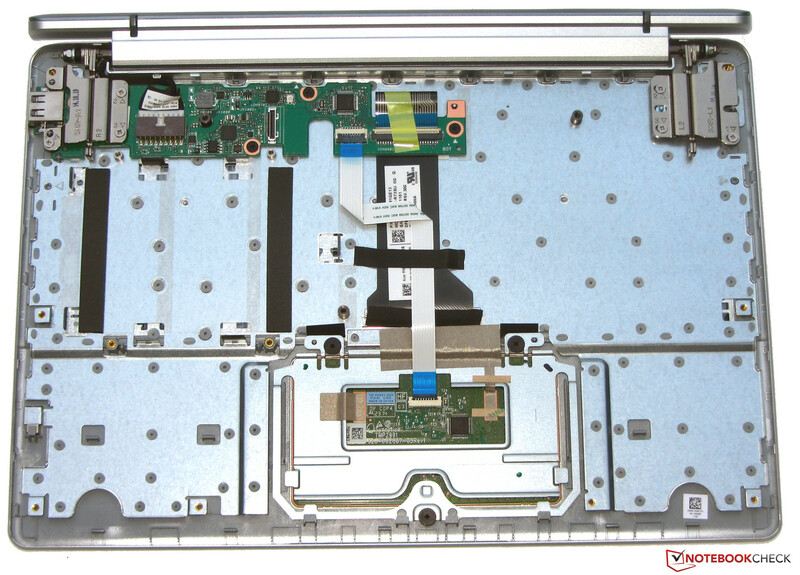 Acer Aspire Switch 11 SW5-171-31U3. 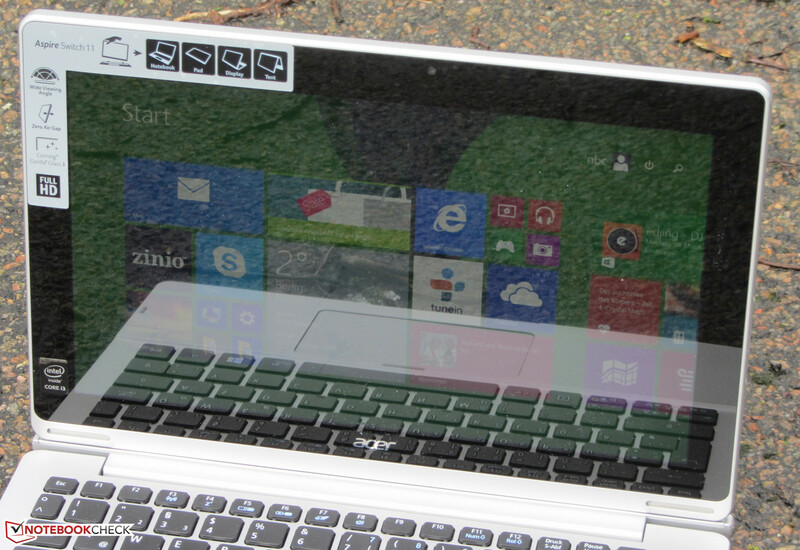 Test model provided by Acer. A warranty of only 12 months is uncommon for a $690 model.